At about 11:00 p.m. local time a day ago, in the European West servers of Dota 2, 10 players queued up for an average, unranked match. Over the course of five hours, these players would rage, taunt, abandon, create new accounts, and become good friends. It was an odyssey of Dota matchmaking, a play in five acts, and God bless it, a damn glorious battle. With no real “surrender” option, Dota matches can last anywhere from 20 minutes to an hour-plus on the long end. Five hours, though, is a grand new high—for comparison, the longest competitive match was a qualifier match between SFZ and Cloud9 in 2015, which went for 3:20:34. Unlike that match, there were no map breaks or fire in this one, but still plenty of exponential scaling. And it was absolutely ridiculous. As commenters on Reddit pointed out, the game had all the natural trappings of a game that was going to go late. 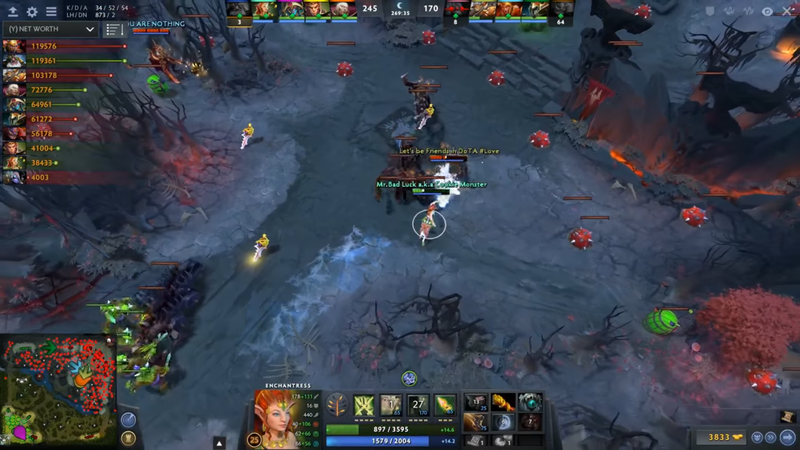 It included Sniper and Techies, two heroes who can hold a defensive line for a long time; a Legion Commander, whose Duel ultimate gives her bonus damage if she duels a foe and wins, allowing her to scale infinitely; Invoker, who even when he’s behind, can swing team fights with his arsenal of spells; and a Tinker, whose waves of machines endlessly rebuff waves. Basically, it was near-impossible for either team to actually play offense, as they both picked heroes who work best on defense. The real stars of the game are the personalities, like the self-effacing Lion and aggressive Legion Commander, whose interplay really carry the middling second act of this epic. As the players begin to tire near the two-hour mark, requesting smoke/toilet breaks and expressing a desire for rest, Legion Commander’s latent toxicity carries the script. Kills go back and forth, but neither team can strike the critical blow. As Legion Commander’s Duel damage bonus continues to skyrocket, they taunt the enemy team. Granted, this was at the 27-minute mark. LC was confident. By the 3:15:00 mark, the Radiant team had overcome a massive gold deficit, given enough kills by the fully itemized Dire to buy their own high-end items. Frustrated, Tinker abandons the game, as they apparently needed to pick someone up at the airport. No others abandon though, and each side carries on back and forth. During the match, Lion brags that they’ve created 17 Steam accounts during the course of the game, purely to report Legion Commander for communication abuse. Techies has built up a veritable wall of mines within the Dire base, holding off Radiant pushes with solemn diligence. Divine Rapiers, weapons that offer a huge damage boost but drop on the ground when the holder dies for anyone to pick up, begin to litter the battlefield. Oracle, the patron saint of supports, purchases buckets of blue Sentry Wards, striving to keep vision on the map for their team. Seriously, bless this player, wherever they are. Multiple Bloodstones to lower respawn time, stacking Moon Shards that limitlessly boost attack speed, Divine Rapiers and Maelstroms to clear the ever-increasing waves of minions charging down the lane—if Dota is meant to simulate a battle, this is the closest a game has come to a war. Finally, at 5:03:30, the game comes to a conclusion, as Dire finally brings down the Radiant ancient. Though posted much earlier in the match, a chat exchange suggests this instance of Dota has resulted in Stockholm Syndrome for some of those involved. At least it ended happily? If you’re morbidly curious, you can obtain the replay ID and watch the grand journey in your Dota 2 client on Dotabuff, or you can watch NoobFromUA’s highlight reel, which somehow condenses the game into 13:32. Over the course of the match, players achieved triple-digits in kills and net worth, broke many records, and played Dota the way none of us would ever want to play it. At least it’s better than sitting through the director’s cut of Batman Vs. Superman.